Being the capital of the short-lived Niccolò Fieschi Signoria in the period between 1256 and 1273, inevitably linked with the Genoese vicissitudes until the fall of the Republic of Genoa. The town heavily damaged by the allies during the Second World War, still keeps some important monuments of its glorious past, such as Abbey church of Santa Maria Assunta (“Our Lady of the Assumption”, thirteenth century) which was first founded in 1271 and it has been rebuilt many times over the centuries. It has been bombed during the second world war but it has still its original bel tower and chancel. It houses a considerable series of artworks, some of them coming from other suppressed religious institutes. They include an Incoronation of the Virgin by Andrea della Robbia, the Multiplication of Bread by Giovanni Battista Casoni and St. Bartholomew’s Martyrdom by Luca Cambiaso. From the square you can see Castle of San Giorgio, recently restored, probably originated from a watchtower, a first castle is known to have been built by Niccolò Fieschi in 1262. In 1273 the Genoese destroyed it, and a new fortification, along with a new line of walls, was erected by the podesteria of La Spezia from 1371. Annexed to this edifice, the Republic of Genoa added a new castle starting from 1607. Today the castle houses a museum where you can admire stelae statues belonging to the Copper and Iron Ages of the Lunigiana area and the achaeological, naturalist and ethnographic materials of the town of Luni. 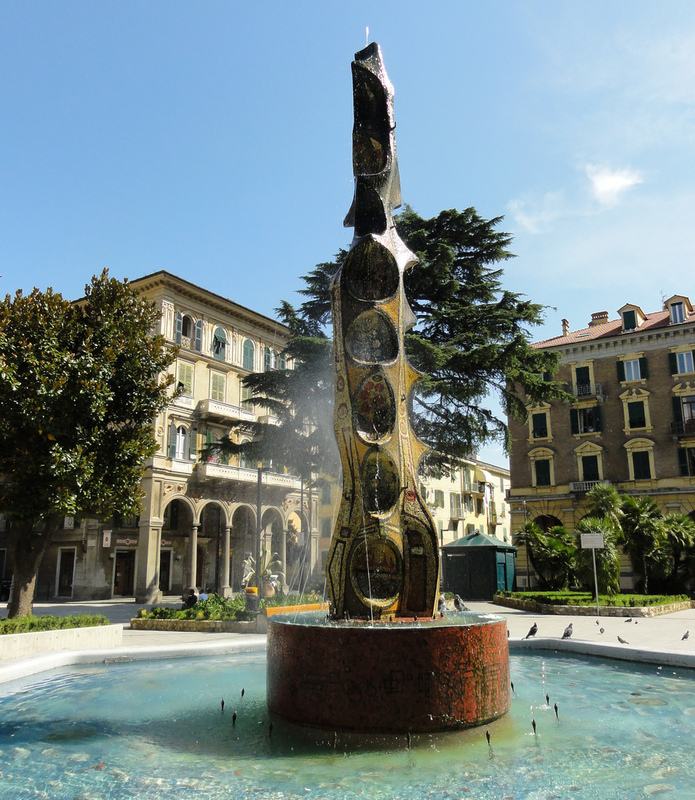 There are other museums to visit in town: Amedeo Lia Museum, museum of ancient and medieval art, Museum of Seals, which houses the collection of seals donated by Cappellini family, the Ethnographic Civic Museum “G. Podenzana”, the Diocesan Museum, the Technical Naval Museum, the Museum of Modern and Contemporary Art (CAMeC) and the National Transportation Museum. La Spezia is also one of the main Italian military and commercial harbours and hosts the arsenal of the Italian Navy. The Arsenal building is the main symbol of the town. Napoleon was the first to think to build an arsenal but due to his wars he had to give up with this project. Camillo Benso count of Cavour decided to take this project in 1860 and appointed Domenico Chiodo to take part in this project. The project changed the geography of the Gulf of La Spezia and the entire building and its premises occupy 165 hectares. It is the biggest arsenal in Italy. Dry docks, canals, new roads, a railway and an entire neighborood were built near the historic centre. The historic centre remained the same, you can still walk through its narrow streets where houses are consecutives one another. One of these narrow streets is Via del Prione where in the past were given the announcements. Not far from here there is Sant’Agostino square, where in the past there was a convent founded in 1390. Here you can admire the baroque houses. Going on on Via del Torretto you reach Piazza Verdi. Here you can see the Post Office building where you can find a Futurist mosaic by Prampolini and Fillia. Not far from there you can admire Villa Marmoni seat of the academy of music dedicated to Puccini. Here you can see Luigi Allegretti frescos. Going back to Piazza Verdi and following Vittorio Veneto street you can see the Palazzo of Prefettura and not far the Cristo Re dei Secoli (“Christ the King of Centuries”, cathedral), consecrated in 1975. Another interesting building is the courthouse Palazzo di Giustizia, designed by the architect Ignazio Cardarella and completed only in 1994. Not far you can visit a shopping centre dedicated to Kennedy, where social and entertaining events are performed.